Guest readers, including Van Wert City Schools’ Assistant to the Superintendent Bill Clifton; Eric McCracken, owner of Lee Kinstle GM Sales & Service; Rachel Hoverman of the Ohio State University Extension Office; Kelly Houg of the YWCA of Van Wert County; and Van Wert DARE Officer Greg Blackmore, all participated with Van Wert Middle School students in the school’s One Book, One Day project on Friday. 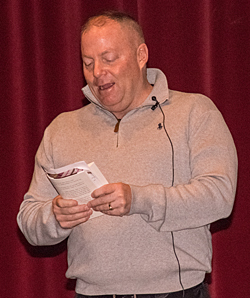 During a school assembly, guest readers began reading the book, All of the Aboveby Shelley Pearsall, following a short video by the author in which she talked about writing the book, which is about an actual event where students at a Cleveland school came together to set a Guinness World Record for building the biggest tetrahedron — a geometric design that has a triangle on each of four sides — in the world. As part of the assembly, guest readers talked about their own reading experiences, as did VWMS Principal Mark Bagley and VWMS teacher Ben Laudick. Laudick, who explained that students would be reading the entire 237-page book on Friday, noted that students read every day, whether they know it or not, in their daily lives. Clifton said he didn’t really value reading when he was a student. McCracken said that improving reading skills can also positively affect other subjects, noting that one of his sons needed help reading and, after he received it, his math and science grades also improved. Hoverman, the wife of teacher Nate Hoverman, told students they should find a book they love that also makes them love reading. “I guarantee that there is a book that has already been written for every single kid in this room,” she added. Houg, who is advocacy coordinator for the YWCA, said reading allows her to hear someone else’s story. “Reading, for me, offers me the same opportunity that my job does, because it allows you to hear a story about something you may or may not have ever been exposed to,” Houg noted. Blackmore agreed about reading being a way to learn about other places, events, and situations they may not have been aware of. In addition to reading the book, students also completed related projects, such as building their own tetrahedron. Each student also received a copy of the book, which they can have Pearsall autograph during her visit to the school on Tuesday, March 5.